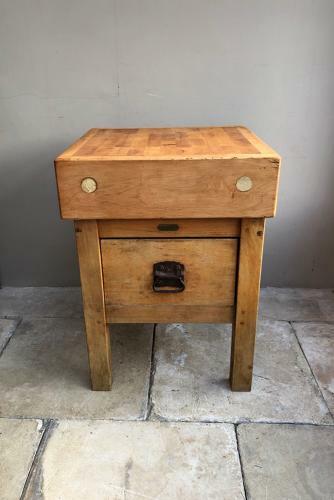 A lovely condition Maple 2 foot x 2 foot butchers block on its base with double sided drawer. The Butcher would work from this block from either side and so each side is identical with the same iron handle each side ie no back. The base is older than the top but that is only because the Butchers kept their bases and replaced the tops as they became to worn. This came from a retired Butcher in Stoke Ferry, Norfolk and he hadnt overly used the block before he finished work so the top is a superb thick very flat and useable block. I have been buying butchers blocks for many years and have an industrial sander which takes off the knife marks and fat residue and then buffs the wood to get the individual maple squares showing again. I have seen so many dirty blocks just waxed over and of course once they get in a warm kitchen the fat melts and you have a smelly & dirty block - this isnt! Great height to work at and a superb small central island for a cottage kitchen, or incorporate into a larger freestanding kitchen. Collection or Courier UK £55 (Not including Scotland).